PT4705. 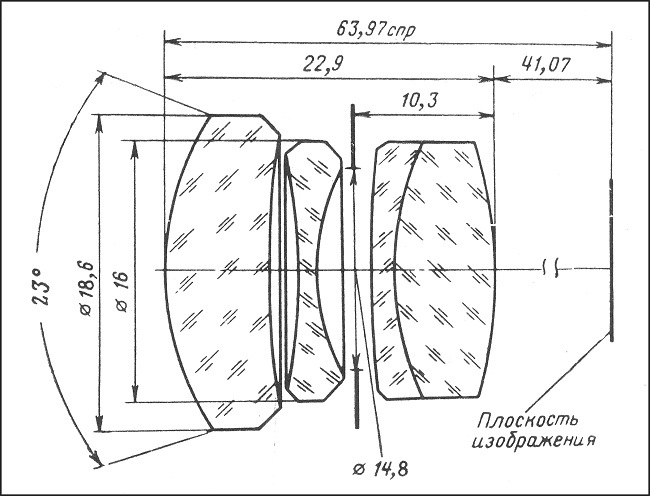 Prototype lens (OB-197), calculated in 1958 by GOI. Very few samples released by GOI in 1958-1960. Focal length - 5.2 cm, aperture range f2.8 - f22. Focusing range from 1 m to infinity. Number of elements/groups: 4/3. Angular field - 46º. Zorki (M39) mount. Never happened to see a sample alive. PT4705 - Industar-61 prototype lens (GOI). PT4710. An earliest known productional version of Industar-61 2.8/52 mm lens, so called "PANDA". The glass of all Industar-61 lenses has the element Lanthanum in it, to aid in contrast. Released by FED in 1962-1964 to replace Industar-26M 2.8/50 mm lens on Fed-2, Fed-3 and Fed-4 cameras. Focal length - 5.2 cm, aperture range f2.8 - f22. 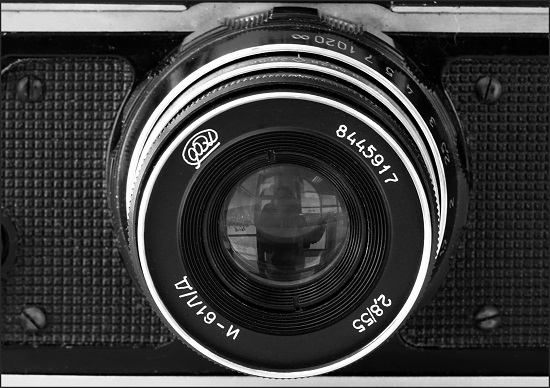 Focusing range (in meters): 1-1.4-2-2.8-4-5.6-8-11-22 and infinity. An easy to find nowadays. 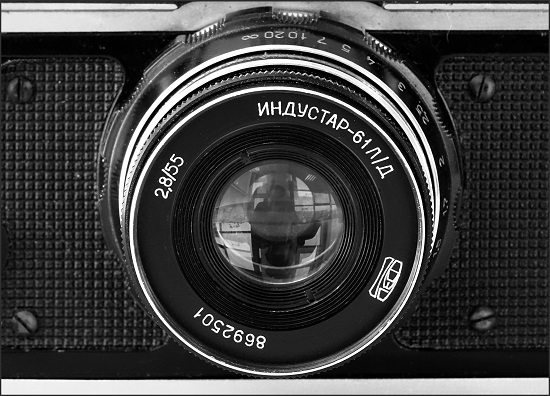 An earliest so far known lens has s/n #000104 (SovietCams, see picture opposite). PT4715. Industar-61 lens identical to PT4710, but with date prefix in the serial number. Lens common to find, since released in 1964-1965 only. Known sample has s/n #6496741 (eBay 2016). PT4710 - Industar-61 #000104 (FED). 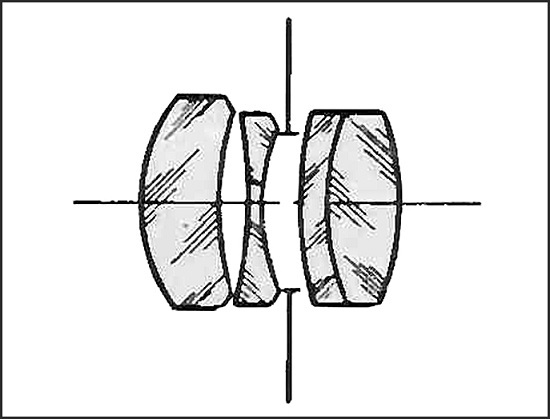 Optical scheme of Industar-61 lens (FED). PT4720 - Industar-61 #400451 (MMZ). PT4725. 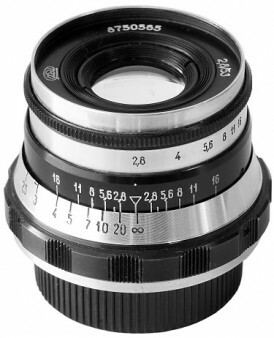 A very uncommon lens to find. 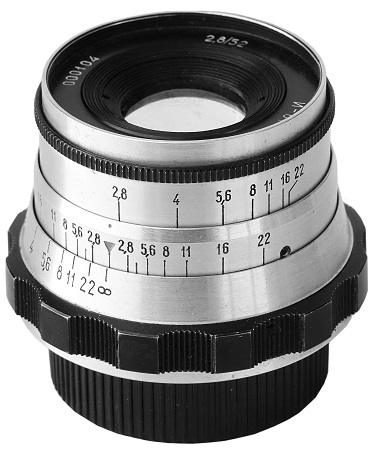 Totaly different and solid body design with "Industar-61" 2.8/50 markings on the faceplate. Very limited batches released in 1964-1967 by LZOS factory. Two first digits on serial number indicates year of release. Focal length - 5 cm, aperture range f2.8 - f16. Focusing range (in meters): 1-1.1-1.2-1.3-1.5-1.7-2-2.5-3-4-6-12 + infinity. 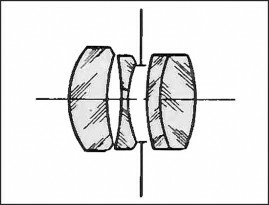 An earliest so far known lens has s/n #64073 (I.Stolyar coll.). PT4730. Identical to PT4725, but with character "L" in the name markings (L - stands for Lanthanum). Very limited batches released in 1964-1967 by LZOS factory. An earliest so far known lens has s/n #64193 (private coll.). PT4730 - Industar-61L #64279 (LZOS). PT4735. Back to FED lenses again. 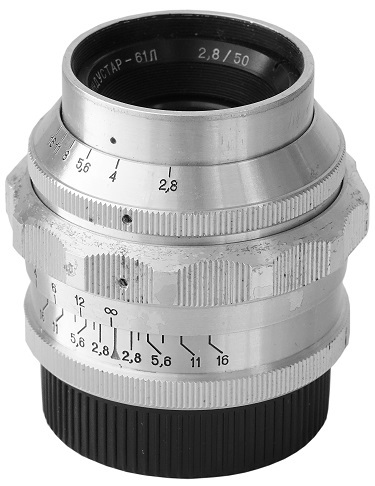 Very common type of the Industar-61 lens, so called "ZEBRA". Released in 1965-1972 by FED. Old FED logotype on the faceplate. Two first digits on serial number indicates year of release. Focal length - 5,2 cm, aperture range f2.8 - f16. Aperture settings with f-stops (without f-stops on previous versions). 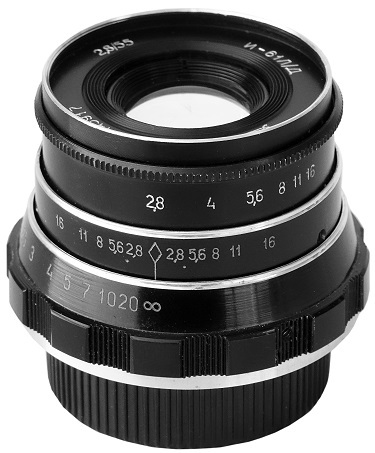 Focusing range (in meters): 1-1.1-1.2-1.3-1.5-1.7-2-2.5-3-4-5-7-10-20 + infinity. An earliest so far known lens has s/n #6519988 (SovietCams). PT4740. Identical to PT4735, but with changed system of serial number codings. Only the very 1st digit "2" indicates the year of release - 1972. 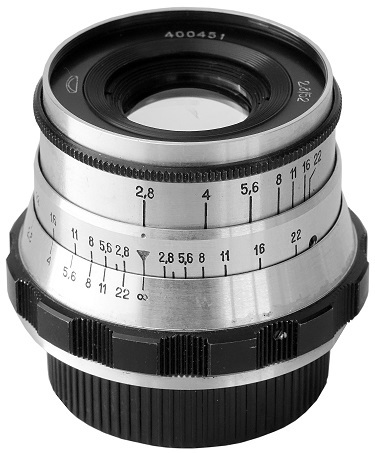 An earliest so far known lens has s/n #2116852 (eBay 2016) and was released in October 1972. PT4745. The new serial number coding system again. All serial numbers now starting with digit "8", the meaning of this coding is unclear until now. Released in 1973-1975 only (unconfirmed). No otherwise different from types PT4735 or PT4740. PT4735 - Industar-61 #6519988 (FED). PT4750. Identical to type-PT4745, but with cored triangle symbol on the focusing range index's disk, instead of white triangle symbol on previous versions (see comparison picture below). Slightly different body design. An earliest so far known lens has s/n #8672344 (I.Stolyar coll.). PT4755. Identical to PT4750, but with changed focal length - 5,3 cm (53 mm), instead of 5,2 cm (52 mm) on previous versions. 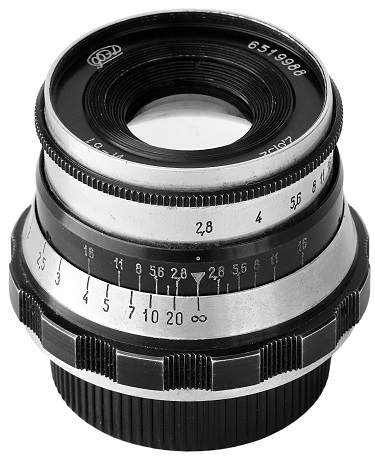 An earliest so far known lens has s/n #8750565 (SovietCams). PT4755 - Industar-61 #8750565 (FED). PT4760. 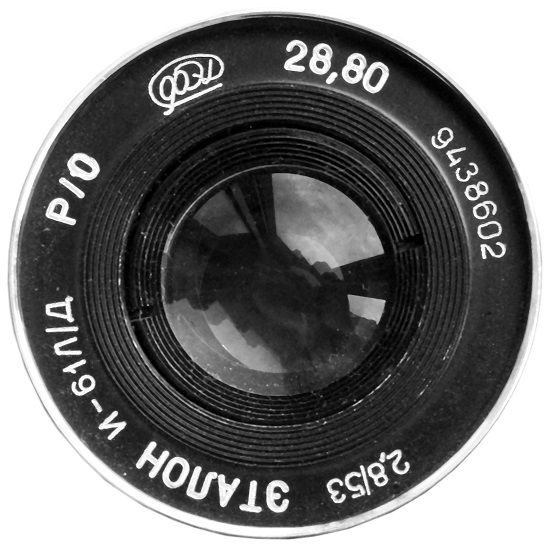 Very common type of the Industar-61 lens, so called "BLACK". Slightly different body design. "И-61Л/Д" markings on the faceplate with old FED logotype yet. 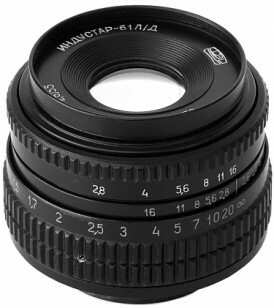 Focal length - 5,3 cm (53 mm), aperture range f2.8 - f16. Aperture settings with f-stops. 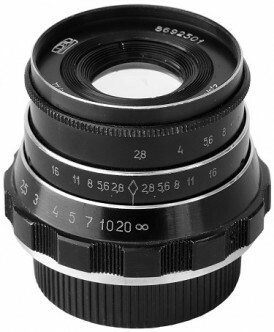 Focusing range (in meters): 1-1.1-1.2-1.3-1.5-1.7-2-2.5-3-4-5-7-10-20 + infinity. An earliest so far known lens has s/n #8963155 (I.Stolyar coll.). 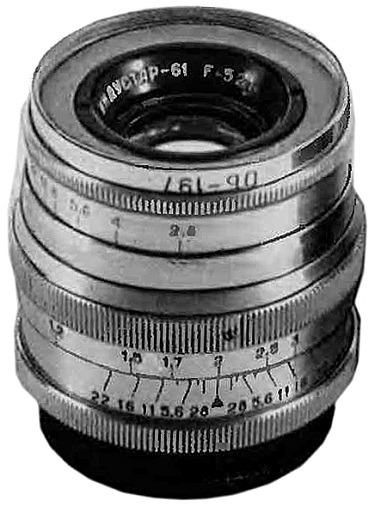 Unique Industar-61 lens from DVD Technik coll. 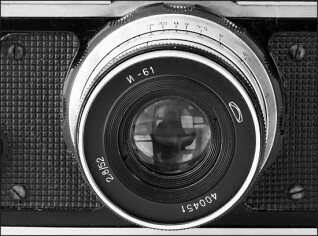 PT4760 - Industar-61 #9488737 (FED). PT4765. Visually identical to PT4760, but with changed focal length - 5,5 cm (55 mm), instead of 5,3 cm (53 mm). Released by FED since 1980. Two first digits on serial number indicates year of release again. 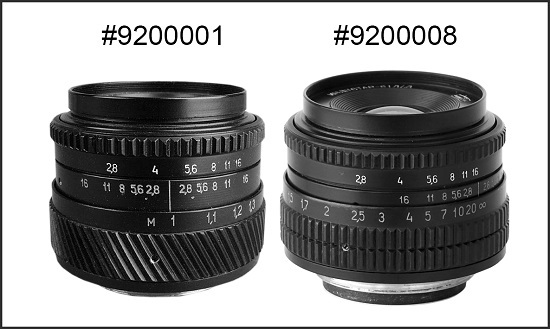 An earliest so far known lens has s/n #8306858 (eBay 2016). PT4765 - Industar-61 #8445917 (FED). PT4770. Seems to be the latest version of the regular Industar-61 lens. Visually identical to PT4765, but with new FED logotype and "Industar-61L/D" markings on the faceplate. Two first digits on serial number indicates year of release. 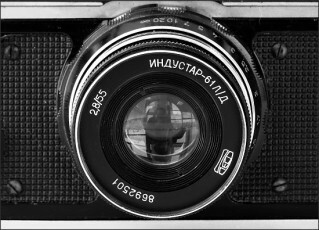 An earliest so far known lens has s/n #8692501 (SovietCams). PT4770 - Industar-61 #8692501 (FED). Lens #9200008 opposite from Ilya Stolyar (USA) collection. PT4775 - Industar-61 #9200008 (FED).